Flash triggers are devices that relay a signal from your digital SLR camera to the flash unit, telling it to fire. By far the most common trigger in use is the camera's hot shoe itself. Once the metal contacts on the flash connect with the plate on the top of your SLR, the camera is able to send a signal to the flash every time you press the shutter release button. It's simple, but does come with a few limitations. I'll talk about those limitations, and the pros and cons of other flash triggers in the paragraphs that follow. The first limiation of a hot shoe trigger is that the flash is physically attached to the camera. If you don't have a ceiling or wall handy, then your only option is to point the flash straight at your subject and light from the front. This means that you don't have quite the same creative range with a flash attached to the hot shoe as one that's truly "off camera". All this is not to say that using the hot shoe as a trigger is without benefits. In fact, there are two fairly substantial ones: simplicity and ease of use. For example, if you're the owner of a Canon Digital Rebel, all you have to do is find a matching Canon external flash unit. Attach the flash to the hot shoe, set the camera on AUTO mode, and fire away. The electronics in the camera and flash figure everything out so that you capture a lot of good exposures. Using a hot shoe trigger also provides you with flexibility: you can quickly change your flash-to-subject distance without having to change any setting on your flash or re-adjust its position. If you've ever seen paparazzi taking photos of celebrities, you'll notice that they ALL use external flash units attached to their cameras. This allows them to jostle around for the best angle and move with their subjects without ever having to fiddle around with the flash settings. Perhaps you like the simplicity and flexibility offered by a hot shoe trigger, but aren't thrilled with the limitation that the light always comes from the direction of the camera. The solution for you is a hot shoe extension cord. 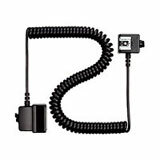 Just plug one end of the cord into your camera's hot shoe and insert the flash into the other end. Now you have all the power and versatility offered by that direct link between camera and flash, BUT you can move the flash around so that the light falls onto your subject from left, right, above and below. This second issue just means that this type of flash trigger works better with non-moving subjects. If you're trying to chase down your subject, juggling both camera and flash can make it hard to capture the right shot at the right moment. Some of the more expensive digital SLR cameras include a special port that lets you connect the camera to a wide variety of flash units. This port is designed to be used with a flash trigger called a PC Sync. The huge advantage that PC sync has over hot shoes and hot shoe extension cords is that with PC sync you can connect to BOTH studio strobe flashes as well as small external flash units (provided it has some way to connect a PC sync cord). All that you need is a little device called a hot shoe to PC adaptor. 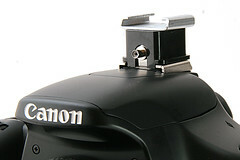 This small connector attaches to your camera's hot shoe (just like an external flash unit) and it includes a PC sync port. 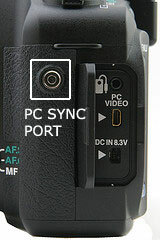 Now you can connect a PC sync cord to it and your camera will trigger flash units as if it had a built-in PC port. The second advantage of PC sync is that you can really use OFF-CAMERA flash. While hot shoe extension cords are limited in length, you can get yourself a 12 foot PC sync cord. This provides you with even more flexibility to manipulate the position of the flash for optimal light (since you can position the flash on a stand a full 12 feet away from the camera). Despite the questionable name, slave triggers can be quite useful, especially if you want to fire multiple flash units at the same time. A slave trigger is a feature of the flash unit, and it's a device that fires the flash whenever another flash goes off. The minute the slave trigger detects the light from your built-in flash, it fires the flash sitting on the stand. The obvious advantage here is one of expense: you can have multiple flash units all activating at the same time without having to spend a lot of money on fancy triggers. So long as each flash has a slave mode, they will all fire when any other flash goes off. Another issue to be aware of when working with slave triggers is that there often must be initial source of light that sets off the slave. This means that with a slave flash setup, you're working with a minimum of TWO light sources. The exception to this rule is some of the more expensive manufacturer-specific external flash units. When attached to your digital SLR, these units allow you to disable the flash so that they act as wireless triggers for other slave flash units. The benefit of a setup like this is that you can choose whether or not you want the primary flash to add light to the scene. 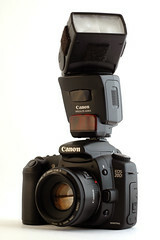 One of the most reliable - and therefore expensive - ways to activate different flash units is by using a wireless trigger. Like slave triggers, wireless triggers don't require any cords running from camera to flash. Unlike slave triggers, wireless triggers send a special signal to each flash that you want to fire every time you press the shutter button on your camera. Wireless triggers are able to fire multiple flashes from great distance and some work around corners and through walls. When you set your flash units to slave mode, they tend to go off whenever they detect ANY other type of flash. But wireless triggers ensure that the only thing setting of the flash units is YOUR camera. There are currently three camera companies that have their own wireless triggering systems: Canon, Nikon and Olympus. Canon's wireless trigger is called the ST-E2, and it works with many of Canon's latest external flash units. While you can also use an external flash unit on the camera to wirelessly trigger other Canon flashes, the compact size of the ST-E2 makes your camera less top heavy. It's a better solution if you really don't want any light coming from the direction of the camera. The Nikon SU-800 wireless transmitter is part of a complete setup dubbed the Nikon Creative Lighting System (or CLS for short). The nice part about working with the SU-800 wireless system is that you're able to control the light output of the different flash units from the controller, which means you don't have to keep adjusting individual lights manually to get just the right look. The Olympus wireless triggering system isn't something you attach to the camera: it's part of the flashes. Olympus offers two wireless flash units: the FL-35R and FL-50R. These flash units can wirelessly triggered by a variety of Olympus digital SLR camera (like the E-3, E-420 or E-520). If you don't want to get locked up in one brand of camera (although if you buy a lot of lenses you already are) then the wireless flash solution for you is something that's compatible with ANY digital SLR camera. The solution for you is something called a PocketWizard. The PocketWizard system is actually made up of two devices: a transmitter/receiver that attaches to any camera's hot shoe and a transmitter/receiver that attaches to the flash. Since every PocketWizard can both send and receive wireless signals, it doesn't matter which one you attach to the camera and which goes on the flash, but you do need at least TWO of them to send signals back and forth. You'll also need special connector cables to attach your flash to the PocketWizard (which come in a wide variety from simple hot shoes to the phono plugs used with studio strobe lights). 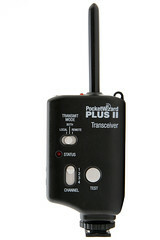 The main advantage that the PocketWizard transmitters have over other wireless triggers is range. You can be at the opposite side of a large ballroom from your flash, and the PocketWizard on your camera will still be able to fire the flash any time you want. PocketWizards also aren't limited by line of sight: this means that you can place the flash around a corner in a different room and you'll still be able to trigger it. The main limitation of a PocketWizard setup is that you must set the power output of all of your flashes manually. If it's your ultimate goal to take wireless flash photos of subjects on the move (where you can't constantly adjust the power of your lights to get a good exposure) then a manufacturer-specific wireless system is going to be a better choice.